Perhaps as early as 1888 Harvey Lewis began a long standing tradition of a grocery store in Hudson Center. 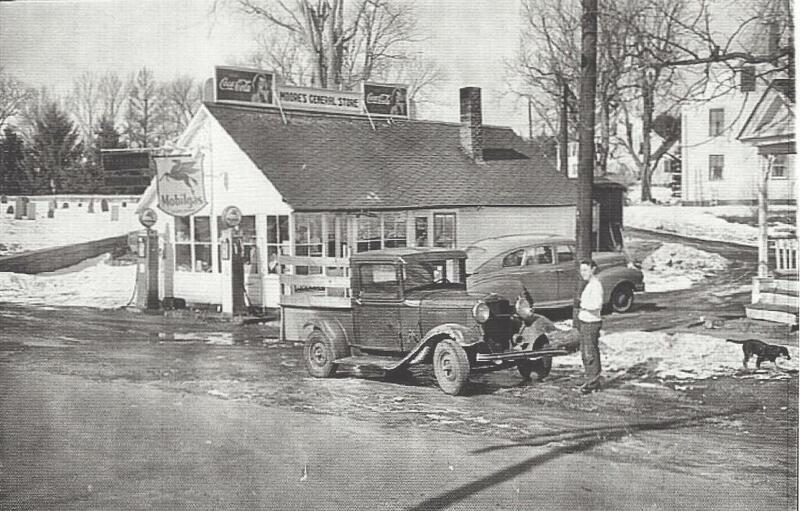 Moore’s General Store at the corner of Kimball Hill Road and Hamblet Avenue began about 1925 when Earl “Dinty” Moore purchased the business from Harvey Lewis. Moore was a rural mailman in town but his family assisted with operating the store. Ownership remained with the family; passing from Earl to his son Kenneth. Later Kenneth’s brother-in-law Morillo Post entered the business. At that time they enlarged the business and added a barber shop and second floor apartments. After the death of Morillo in 1963 the business was sold to David and Robert Thompson; both of whom had worked for the Moore Family in earlier years. The Thompson Brothers operated the store at this location until November 1969 when fire badly damaged the building. Rather than rebuild on this site the Thompsons relocated their business to Central Street. This 1940’s photo shows the business before the building was enlarged by Kenneth and Morillo. This site is now the location of the ever popular Kahil’s sub and sandwich shop. Photo courtesy of Post/Granger Family and now a part of the Historical Society Collection. By Ruth M Parker in Center on March 20, 2015 .